Today we’re proudly presenting one of the most iconic scenes from one of the most mesmerizing shows to ever grace our television screens, MIAMI VICE. It was only a matter a time before this scene saw the light around here. Everyone can appreciate an epic ride into the sunset with Sonny and Tubbs, while waves crash and visions of vigalante coke lords haunt their minds. Russ Ballard’s hypnotic echoed rhythms can be heard in this clip with his track ‘Voices’. The scene and the song complement each other so graciously and effortlessly. They were truly made for one another. So throw on some of your favorite musk and slip into your loafers with no socks…and maybe even have a quick taste of that gram of uncut Colombian you’ve been waiting to unleash at the right moment. For a second you can almost smell the ocean air off this song as it plays over the clip. ← YEAH, ROCK ON, YES. 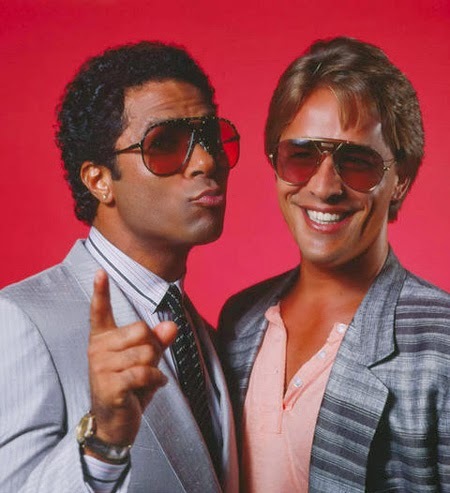 that's not only the ULTIMATE miami vice scene, you also chose the ULTIMATE crockett & tubbs pic… congratulations! p.s. don't ever stop this blog, I'm here all the time regardless of comments.